Cavechat.org • View topic - Subaqueous helictites? I was on a trip into an abandoned mine today to collect some mineral and water samples for some school research I'm working on. The main focus was to get some crystals out of a pool in the mine to confirm in the lab whether or not they are aragonite and I also collected water samples from multiple locations in the pool as well as some ceiling drips. I took a close look at the pool when our group noticed these. I don't know exactly what these are but from their morphology and location they appear to be helictites that formed in the pool. The pool is loaded with calcite spar crystals, shelfstone and possibly aragonite. I'm going to be running the water samples through an ICP soon to see what metal ions are in the water. So my question then is who might I want to talk to who is more of an official speleologist that could help me look into this. I've seen a lot of strange things in this mine I can't explain and that's why I decided to start doing some science. And if any of you are wondering, access to the mine is restricted by the quarry which owns it but I did secure permission to visit the mine and collect samples. Art Palmer would be a great person to start with. Donald Davis is particularly knowledgable on U/W helictites. Almost looks like items have fallen into the pool and become mineralized. 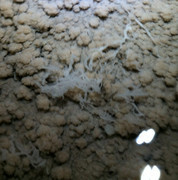 I've seen threads in highly mineralized cave pools that look the same- this is along a tourist cave route. Seeing that it's a mine, there's been a lot of opportunities for foreign material to find its way in there. Mineralized threads do make a lot of sense. The mine does not receive much visitation anymore, other parts of the mine definitely flood as shown by mud that's accumulated up to a foot thick as well as a breakdown pile full of trash. The area with the pool seems to be an isolated part of the mine, only fed by ceiling drips but no mud accumulates on top of the spar crystals that cover the entire pool. Well even if this isn't actually all that exciting there are a few other unusual things in there I'm looking into.